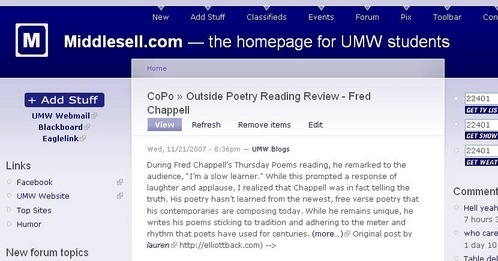 I happened upon Middlesell early this morning (this site is an independent homepage for UMW students established by the inimitable Bobby Durette) only to discover that posts from around UMW Blogs are being fed into this space. How fascinating! So, when I saw that he was pulling posts from the UMW Blogs sitewide feed into Middlesell I really shouldn’t have been all that surprised. He’s a smart guy and recognizes the value of solid content that is directly targeted to his audience, not to mention that he is intimately familiar with with the wondrous power of RSS aggregation. All of which makes me think about a thread on a post D’Arcy Norman wrote recently about creating a blog directory for WordPress Multi-User wherein Bill Fitzgerald suggested how Drupal could be easily configured with views to offer this functionality, but Drupal disciples always mention the Views Module when they want to discount WordPress (and they usually mention the CCK module soon after this) so I wasn’t taking the bait. So, if I understand this correctly, and please correct me if I don’t, WPMu remains the individualized publishing platform and Drupal handles the aggregation, searching , and display. Drupal wrapped around WPMu in other words (something the good folks running Arizona State University’s blogs mentioned to me at ELI last year, but I couldn’t fully grasp it). So, Mr. Fitzgerald, do we have a shared project/vision finally? And, Mr. Durette, might you be interested in experimenting with such a feeding and parsing of content from UMW Blogs into Middlesell? You are one of our local Drupal aces, and your feeding posts from UMW Blogs into Middlesell (I’m assuming this was you, by the way) really brought all these loose connections home to me. If neither of you are interested, I’ll just have to take this silence as a tacit understanding that Drupal sounds great in blog comments and can feed posts into a site like any old aggregator, but just doesn’t have what it takes to push this baby to the next level. No sweat, I just won’t let you forget it for a while is all. This entry was posted in UMW Blogs, wordpress multi-user, wpmu and tagged drupal, middlesell, rss, umwblogs, unique, wordpress multi-user, wpmu. Bookmark the permalink. 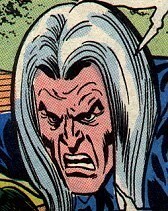 So, in your opinion D’Arcy, given the experience you have with Drupal, how closely can this process be approximated. Brian was right when he said this idea of eduglu was apparent in Planet NV and UMW Blogs (in the comments to this great post by him) on a broader scale, can Drupal handle more granular functionality as Bill suggests? but there’s more to it than simply aggregating. there’s also the dynamic directory (BlogBridge FeedLibrary is the closest thing I’ve seen on that front), and integration with a school’s student info. system (for classes, semesters, cohorts, groups, etc…) to make the process as seamless as possible. The prototypes work manually on a small scale, but for this to work, it’s got to scale to 10,000 or even 100,000 students. First, I would like to say that, wrt “So, if I understand this correctly, and please correct me if I donâ€™t, WPMu remains the individualized publishing platform and Drupal handles the aggregation, searching , and display.” — absolutely. Except that as far as Drupal is concerned, it can be from any site on the web that generates a clean Atom or RSS feed. 3. (and this is my favorite) Map elements of a feed to specific taxonomies/fields — so, if a feed contains additional metadata about the content, you can map that to a specific field, and create another method of sorting/routing/displaying content. Between 2 and 3, you start to approach the functionality that D’Arcy is describing. There will definitely be new code required to extend what we currently have in place, and particularly to improve the UI to make it EASY to use, but extending/creating UI tweaks is a far cry from having to build up from scratch. Within the current proof of concept, you can filter by multiple taxonomy terms, by author, by date, and the site also generates feeds of all imported content. Most importantly, it also retains a link back the original post. We’re getting closer. I’d love to see what could happen if we got some folks to get painfully specific about what would be needed to make this work.